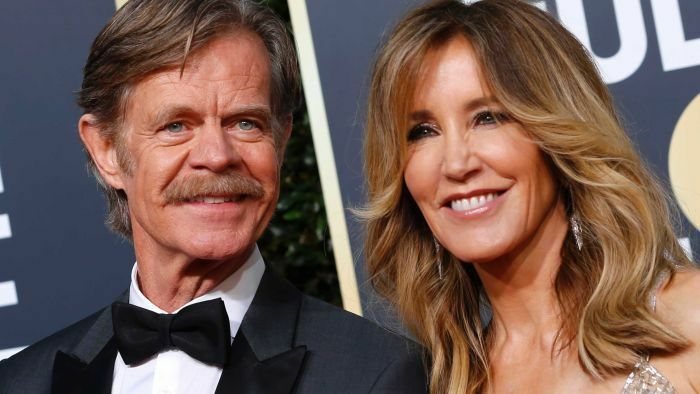 The college admissions scandal that erupted this week has triggered private litigation accusing rich, well-connected parents — including Hollywood stars — of buying spots for their children at prestigious schools in the United States, and keeping children of less wealthy parents out. A $US500 billion ($705 billion) civil lawsuit filed by a parent in the California Superior Court this week has accused 45 defendants of defrauding and inflicting emotional distress on everyone whose “rights to a fair chance at entrance to college” were stolen through the alleged conspiracy. In the largest-known college admissions scandal in US history, federal prosecutors said a California company made about $US25 million by charging parents to secure spots for their children in elite schools, including Georgetown, Stanford and Yale, by cheating the admissions process. Jennifer Kay Toy, a former teacher in Oakland, California, said she believed her son Joshua was not admitted to some colleges, despite his 4.2 grade point average, because wealthy parents thought it was “OK to lie, cheat, steal and bribe their children’s way into a good college”. Ms Toy did not say if any colleges admitted her only child, or where Joshua might have won admission. Fifty people, including 33 parents and many athletic coaches, were criminally charged in the scandal, which is being overseen by prosecutors in Boston. Among the 50 were Desperate Housewives star Felicity Huffman, Full House actress Lori Loughlin and her fashion designer husband Mossimo Giannulli. They are among the defendants in Ms Toy’s lawsuit, as is William Singer, the accused mastermind of the scheme. Prosecutors said Singer, who has pleaded guilty to racketeering charges, used his Edge College & Career Network and an affiliated non-profit to help prospective students cheat on college admission tests and bribe coaches to inflate their athletic credentials. Colleges and companies have moved swiftly to distance themselves from employees swept up in the nationwide scandal, with prosecutors alleging some parents spent as much as $US6.5 million to guarantee their child’s entrance. Ms Loughlin has since been dropped by TV network Hallmark and her daughter Olivia Giannulli, a prominent “influencer” on social media, lost a sponsorship deal. Ms Loughlin is accused of paying Singer $US500,000 to help both of her daughters cheat their way into USC by bribing an athletics official at the school to pretend the girls were gifted rowers. Crown Media Family Networks, the company that owns the Hallmark cable channel, said it had stopped working with Ms Loughlin, who appears in its program Garage Sale Mysteries. “We are no longer working with Lori Loughlin and have stopped development of all productions that air on the Crown Media Family Network channels” involving the actress, the company said in a statement. Hallmark’s announcement follows an earlier one from LVMH’s Sephora beauty chain, which said it was ending its partnership with Ms Loughlin’s daughter, who goes by the name Olivia Jade online. Products from her make-up collaboration had been removed from Sephora’s website by Thursday afternoon. It was not immediately clear whether her products were available in stores. “After careful review of recent developments, we have made the decision to end the Sephora Collection partnership with Olivia Jade, effective immediately,” a Sephora representative wrote in an email on Thursday.